If you are looking for Art Nouveau Wallpaper, then take a look at the Grandeco Art Nouveau Damask Glitter Wallpaper in Silver. A beautiful design which will add a touch of elegance to your home this season. 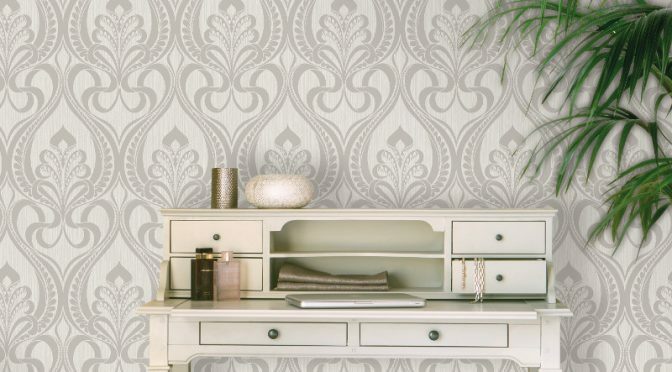 First of all, this delightful wallpaper brings a timeless damask design into the 21st century with a fresh, new look. Of blown vinyl construction, this wallpaper has a wonderful textured finish. Also, this is a classic silver and grey colour scheme which combines with glitter accents for a glamorous finish. Most of all, the Grandeco Art Nouveau Damask Glitter Wallpaper in Silver is subtle enough for use throughout a room or can be used to create a feature wall if desired. Finally, a washable finish ensures it’s the perfect choice for any home.